In Sweden, Dec. 13 marks St. Lucia Day, a day traditionally when the oldest daughter of the family wears a white robe, a red sash, and a wreath of lit candles on her head as she delivers coffee and saffron buns to the rest of the family still huddled in bed against the cold and dark morning. St. Lucia is one of the very few saints honored by Lutheran Scandinavians (Swedes, Norwegians, Finns, and Danes) and in some parts of Italy. I’m not exactly clear who St. Lucia was, except that she did some self-sacrificing behavior for the good of others. The legends and stories differ depending on the region of the world. What seems to be more important is the timing – a celebration of light and comfort on one of the darkest days of the year. Before the Christians came along and redefined all the pagan holidays to support their worldview, Winter Solstice holidays were focused on using light to shield against perceived forces of evil (i.e. really long nights, bitter cold, and long lines at the mall). St. Lucia comes out of that tradition as well. I’ve never been to Sweden but I’ve heard how very dark it is this time of year. It’s on my bucket list to see the spring flowers burst out in full force in Sweden during midsummer celebrations when the days are longer than the nights. Somewhere I have some distant cousins of my grandfather’s who live there, and I carry a Swedish last name. 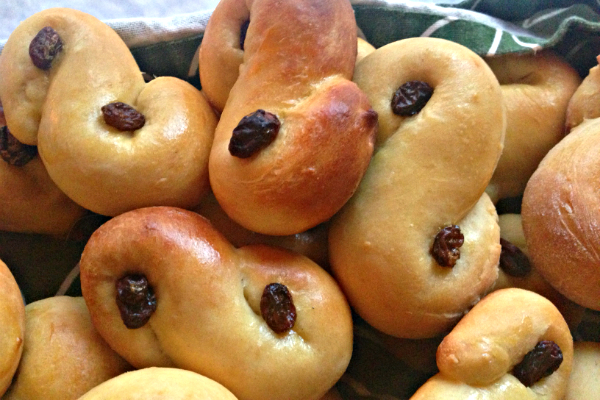 So I’ve had a yearning the past couple of years to figure out how to make saffron buns for St. Lucia Day. But dough is fickle. It takes time and patience and doesn’t give a flip if you are a working person who doesn’t have the time to wait around for it to rise already. When I was hunting for saffron at my corner store I happened to strike up a conversation with a store manager who is half Swedish and makes saffron buns every year with her family. She said they have a special wooden bowl they use to let the dough rise, and even set it in the laundry room to help the process. 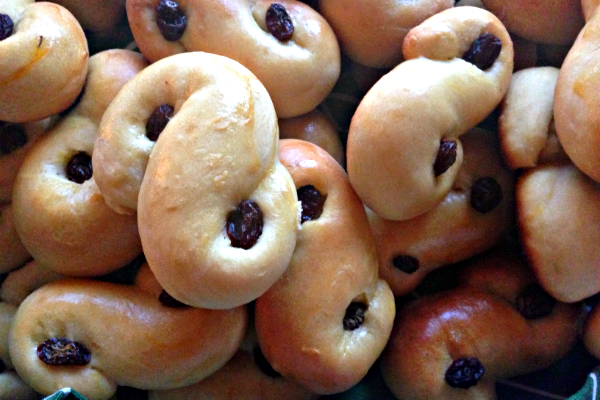 Saffron buns require two rising periods, first after you mix the dough, and a second time after you shape the buns. So if you have a job outside the home, I recommend you start this late the night before. Put the dough to bed when you turn in and then get up at 4:30 a.m. to finish the task. I don’t know what else to tell you. Maybe just take the day off. I tried this schedule this year and the results were a little more successful than my first attempt last year, which had me willing the dough to rise in time so I could put the buns in the oven and make it to work before the afternoon holiday party. They turned out to be kind of a flop, but people ate them anyway because they had never seen St. Lucia saffron buns before. This year, with a better recipe my college friend Jen gave me, the buns were a little more successful. I may even tweak the recipe again for next year after finding this King Arthur Flour recipe that recommends melting the butter first, adding the saffron, and then letting it sit for a half and hour to draw out the saffron flavor even more. So how did expensive saffron grown in southern climes come to be cherished by the northern Swedes? It’s a good question, and probably tied to the developing spice route across Europe in the Middle Ages. It is very expensive, but considered a holiday indulgence and you just need a pinch for saffron buns. I have not found a fully satisfying answer in my research, nobody really seems to care, only that is is a tradition. So if you know something please be in touch! St. Lucia Day evolved from being a rural farmhouse tradition to a nationally celebrated event in the 1920s when Stockholm declared an official “Lucia” for that year. Soon other cities followed suit, and now the day is marked by long processionals of girls singing and carrying candles, accompanied by “star boys” and “Gingerbread men” so all children can participate. Even across the United States you can find Scandinavian communities who appoint their own Lucia each year. 1. Dissolve yeast in warm water and set aside. 2. In a sauce pan over medium heat, warm milk and then add butter until it is melted. 3. Combine the yeast, milk, melted butter, eggs, salt, saffron and 2 cups of the flour to a bowl. Mix with a hand mixer using bread hooks for 3 minutes. Then add the remaining 2 cups of flour and combine using a wooden spoon. 4. 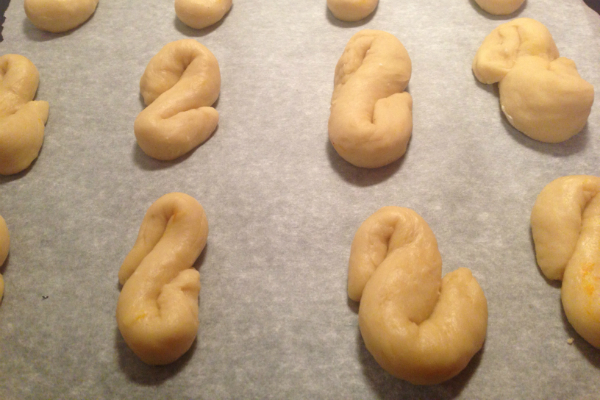 Turn onto a floured surface and knead dough, adding a little flour for easier handling. 5. Return to a clean, greased bowl and cover with a tea towel. Set in a warm place and let rise until the dough has doubled. 6. Turn out onto a floured surface. Pinch off palm-sized pieces of the dough and rollout into “logs” 6 inches long. Shape into and “S,” curling the ends in opposite directions tightly. 7. Place on a lightly greased cookie sheet (or use parchment paper) about 1 inch apart. Cover with a tea towel and let rise until they appear puffy (about 1/2 an hour to 1 hour). 8. Position oven rack to center of oven and preheat oven to 375 degrees F.
9. Mix an egg with 2 tablespoons of water, then brush the tops of the risen buns. Place a raisin in the center of each curled end. 10. Bake cookie sheets one at a time for 18-20 minutes, until buns are golden on top.